Volkswagen AG is planning to roll out a production car that will combine a plug-in hybrid powertrain with low weight and aerodynamic shape to reportedly achieve a startling fuel efficiency rating of 261 miles per gallon (mpg). 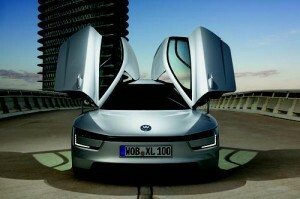 Although the mileage numbers will almost certainly drop when a US EPA rating is applied, the XL1, as it’s known, will likely be the most fuel efficient production car in the world. Today‘s best vehicles — the Honda Fit EV, Scion IQ EV, Mitsubishi i-MiEV, and Ford Focus Electric, among others — typically have mpg-equivalencies that are less than half that of the proposed VW. Indeed, in the years of development work that went into the new VW XL1, the company’s engineers incorporated virtually every available fuel efficiency feature. The new vehicle supplies just enough power to make itself road-worthy, while incorporating enough low-mass components to keep its energy needs low. A 47-HP turbo-diesel engine, for example, sips fuel, while a 27-HP electric motor gives it a enough pop to hit a top speed of 99 mph. The key to its road-worthiness is its low weight. At 1,753 pounds, it’s less than half of the Chevy Volt’s 3,781 pounds, thanks to liberal use of lightweight materials. Approximately 20 percent of the vehicle employs carbon fiber-reinforced plastic, including the monocoque, body panels, anti-roll bars, and numerous other parts. The brakes also use carbon fiber ceramics, while the engine crankcase, steering gear housing, dampers, and other suspension components are made from aluminum. Even the XL1’s windows were designed with weight reduction in mind, all of them being made from polycarbonate. VW’s new vehicle may also offer the lowest drag coefficient in production car history. At 0.189, it’s lower than the Toyota Prius (0.25), Tesla Model S (0.24), Mercedes-Benz CLA-Class (0.23), and General Motors’ EV1 (0.195). It accomplishes that with a tadpole-like shape that’s wider at the front than the rear. The real test of the vehicle’s efficiency, however, may lie in its all-electric performance. Using a 5.5-kWh water-cooled, lithium-ion battery, the XL1 can travel 32 all-electric miles, meaning it gets close to six miles to the kilowatt-hour. That’s almost twice that of the Volt or Leaf. All of the fuel efficiency ratings will be up for debate, of course, as the vehicle’s limited rollout nears. The XL1’s 261-mpg figures are based on European Commission methodology, which calls for the vehicle to travel 100 km, using its all-electric mode, followed by a diesel fuel mode. US EPA test cycles, however, are notoriously tougher. General Motors notably proclaimed a 230-mpg efficiency for the Volt and Nissan said its Leaf would get 367 mpg in 2009, before EPA test cycles put both vehicles closer to 100 mpg-e when they were launched in 2010. Volkswagen isn’t talking price yet, but is saying that production will be light and will start soon. The German automaker is already retooling a plant in Osnabruch, Germany, to build the XL1 in “a limited production run.” Unofficially, VW officials have talked about manufacturing only 250 vehicles, but the number could climb into the low thousands. ”What we can say is that it’s going to be in peoples’ hands fairly soon,” Gillies told us.